If your AC power distribution system uses only two wires, here are some tip on things to watch out for. Using the AIM's and VNA's with handheld tablets. New tablet computers can run the AIM and VNA programs to provide a very compact test unit for field operation while retaining precision for lab use. Here is a document with more details on setting up the tablet. Click for more information on the AIM4300 . The AIM4300 is the replacement for the AIM4170D. It features an upper frequency limit of 300 MHz. they are compatible with Windows tablets. The VNAuhf is in stock. 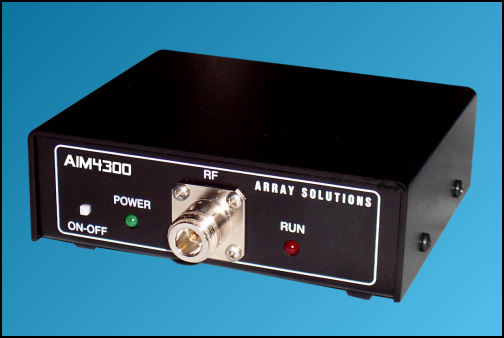 Features similar to the VNA2180 with coverage up to 1 GHz. Click for more information on the VNAuhf . Click for the latest information . The VNA2180 is in stock. Feb, 2019: The AIMuhf has been discontinued. Same features as the AIM4300 with coverage up to 1 GHz. Click for more information on the AIMuhf . The PowerAIM model-150 has replaced the earlier model called the PowerAIM-120. Greater immunity to interference (up to 150V peak). Multiple input ranges for improved accuracy. Measurement range up to 150MHz. Better performance and lower cost than the PowerAIM-120. The new PowerAIM-150 was introduced at the National Association of Broadcasters (NAB) Show in Las Vegas in April, 2017. By using the AIM or VNA to measure fundamental crystal parameters, the procedure for designing crystal filters is straightforward and the results agree very well with theory. How to measure the parallel capacitance across high value resistors. The results using an HP8753B and an AIM4170C are compared. Ian, G3NRW, has prepared an excellent and very comprehensive presentation on the AIM4170C. This features several applications of real antennas and also examples using the TDR function. John, WQ1P, has sent us information about using a tablet PC and a MAC with the AIM4170. This application note shows how the AIM4170B can be used to measure the Q of coils and tuned circuits and to evaluate transformers. See the QST product review of the AIM4170 in the August '07 issue. "High accuracy, ease of use and multiple output parameters make the AIM4170 a great addition to your home laboratory." This article in Nov, '06 QST describes an earlier version of the AIM which covered the HF band up to 32 MHz. The principles of operation are the same as the AIM4170. It is presented here with permission of the ARRL. Checkout the AIM4170 reviews at eHam.net. This article in the Nov/Dec '06 issue of NCJ describes an earlier version of the AIM which covered the VHF band up to 160 MHz. The principles of operation are the same as the AIM4170. It is presented here with permission of the ARRL. 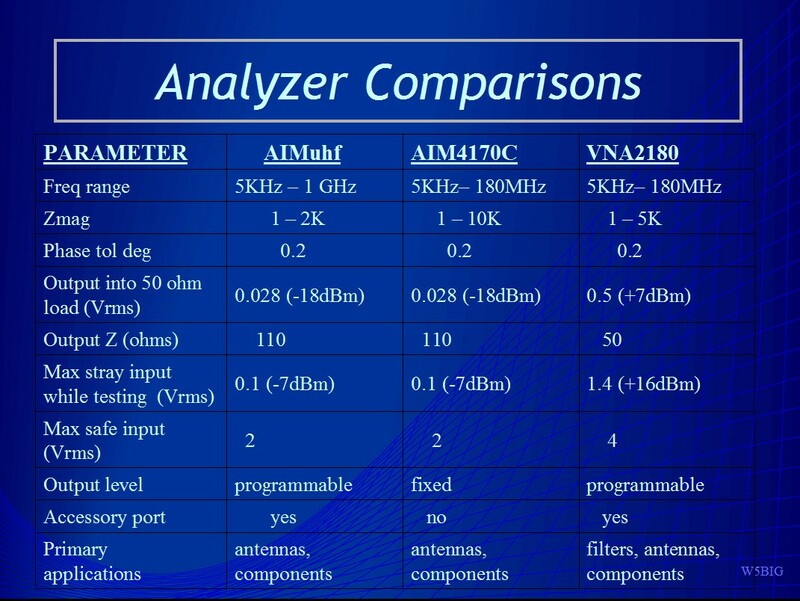 The AIM4160/4170 compared with several other antenna analyzers. The AIM4170 tolerance to external RF signals is illustrated here. If you would like to make a club presentation, you are welcome to use the AIM4170 Power Point slide show. (The earlier AIM4170 model has been replaced by the AIM4300 model. The basic operating principles are similar. - July, 2018). This new antenna analyzer measures the complex impedance (magnitude and phase) at each frequency of interest in the range of 0.05 to 300 MHz. A PC is used to calculate several parameters, including SWR, and plot the results. The test frequency is generated digitally and bandpass filters are used to reject stray signals (like broadcast stations) that are more than a few KHz from the operating frequency. A 12 bit analog to digital converter digitizes the raw data. This avoids non-linearities associated with diode detectors, and results in very good dynamic range and linearity for accurate magnitude and phase measurements. Impedance measurements can range up to 10K ohms. The true phase angle is measured, so inductive or capacitive reactance can be determined without ambiguity. The RF generator can also be used as a signal source for testing receivers. The frequency is very stable and it can be calibrated to WWV. The digitized data is sent to the PC via an RS232 or USB port. Power for the analyzer can be obtained from a small DC power supply or a battery. With a laptop computer, the unit is quite portable and it can even be mounted up on a tower at the antenna feed point if desired, with power being supplied through the RS232 cable. The impedance at the antenna itself can be read with the AIM4300 located in the shack at the receiving/transmitting end of the coax. The cable can be any length. The cable's impedance and loss characteristics are determined by a simple calibration procedure and the antenna's impedance is plotted directly during the scan. There are no internal adjustments. The complete calibration is done using software and calibration standards included with the analyzer. The frequency range is continuous from 5 KHz to 300 MHz. The scan data can be saved to disk or printed to compare before and after results. It can also be imported in spreadsheet programs for further analysis. The display can be scaled for use on any size computer monitor. The unit of length used for input/output data can be selected as feet or meters. 15 meter dipole antenna. Scan = 20.5 to 22.5 MHz. CIRCUITS AND PROCEDURES used by this system are covered by patent.